Let’s face it: AdWords has A LOT of metric options to measure the efficiency of your campaigns. If this feels overwhelming, don’t worry, all you have to do is use our preset AdWords template and get down to reporting! With our Google Adwords reporting tool’s wide range of widgets and features, pretty much everything about your report is customizable. Add images, comments, and insights so that your reports fit each of your clients’ needs! DashThis connects with multiple other integrations, but there’s no need to copy and paste your data manually from one integration to the other: we take care of that boring part! All that’s left for you to do is analyze your data and orient your marketing strategy accordingly. Although Google AdWords is your primary marketing tool, all your marketing platforms intertwine somehow, and that’s something all AdWords reporting tools should take into account. Was your AdWords campaign more profitable than your Facebook campaign? How much traffic did this AdWords campaign drive to your website? To answer these questions, you will need to connect a few other integrations to your AdWords report, so it’s a blessing DashThis is compatible with more than 30 of the most commonly used marketing tools, isn’t it? We were one of the first in the industry, which makes our body of knowledge incomparable. Our simplicity has yet to be equalled. Our customer service is out of this world. And we’re not even the only ones saying all this! The variety and relevance of the features offered are what makes a good Google AdWords reporting tool, and luckily, DashThis lacks neither of those! With its intuitive design, simple customization, numerous sharing options, multi-user support, and so much more, DashThis has got everything to satisfy even your wildest reporting dreams! Here at DashThis, we don’t believe in making you pay for things you don’t need. This is the reason why our pricing model is based solely on the number of dashboards you want. Then, regardless of the plan you choose, everything else is included: all data sources, unlimited number of users in your account, your very own dedicated account manager, and a whole lotta fun! From campaign costs to the number of clicks, to impressions and ROAS, your PPC campaigns involve a LOT of metrics and it’s easy to get lost in all these KPIs. So why not make your life easier by using our preset PPC report example? 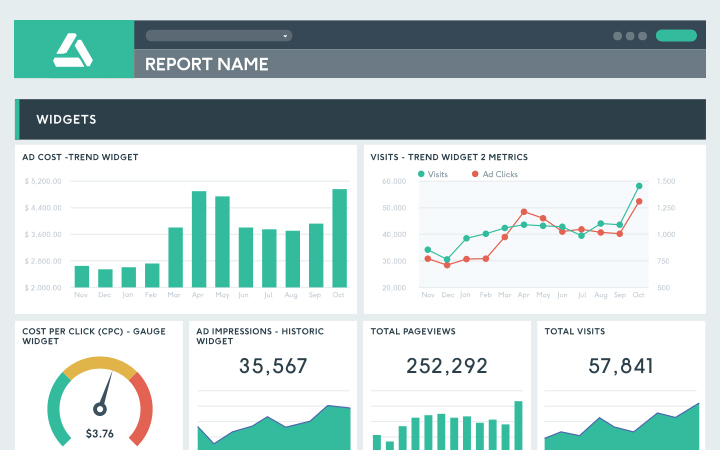 All you have to do is plug in your paid marketing data, and you’re all set to start reporting! Read our blog for more AdWords reporting related content! Curious about the evolution of our Google AdWords reporting tool? Interested in the fantastic world of reporting? Our blog is THE place for you be! In order to never miss out on an interesting topic, you can also sign up for our newsletter (we promise it’s worth it! ).